Economics majors have priority in registering for Economics courses. Students pursuing an Economics Minor are not given this priority and are not allowed to register for upper-division Economics courses until after Krannert registration restrictions are lifted. Course overrides are not provided and space in upper-division courses is not guaranteed. The demand for Economics courses is very high and many sections are already full when registration restrictions are lifted: When registration restrictions are lifted. Students may only complete one of the above minors, not both. A grade of a C- or better must be earned in any course used to fulfill the minor. A course with a grade of "pass" can not be used to fulfil any requirement of the minor. Transfer credit for courses that are a direct match will be accepted for the minor. Undistributed transfer credit (i.e. ECON 2XXXX) will not be accepted. 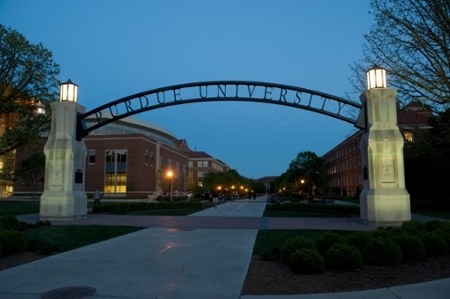 To see how courses from other institutions transfer to Purdue use the Transfer Credit Course Equivalence Guide. Majors in Engineering, Mathematics, and Statistics pursuing a Minor in Economics are encouraged to take Econ 511 (fall semester), Econ 562 (fall semester), and Econ 512 (spring semester). These graduate level courses can be used to fulfill the upper-level course requirements for a Minor in Economics. These three courses can also be used toward meeting requirements for the MS degree in Economics. One option open to students who take these courses is to complete the remaining requirements (21 credit hours) for the MS degree in Economics after graduating by taking an innovative set of online courses specifically designed for the MS degree program. Follow the link for more information on the combined degree program: BS in Engineering, Science, or Mathematics and MS degree in Economics.